Coins on crêpes, flipping crêpes, and crêpes on top of the wardrobe. Has France gone mad, or is it just La Chandeleur? Is February 2nd the most superstitious day of the year in France ? The day of La Chandeleur (or Candlemas) is celebrated 40 days after Christmas - on February 2nd - meaning this year it falls on a Friday. The origins of the celebration go back to Roman times, but over the centuries many French regions have thrown in a string of their own superstitions to prevent the worst from happening, or indeed to bring their family fortune. Here is a selection of our favourites from across the country. In the Franche-Comté region, a proverb says that if someone can carry a Chandeleur candle stick all the way home from church without it extinguishing, then that person will "for sure stay alive this year". A bit of a morbid superstition for a candle, you might think, but you've obviously not heard what the folks down in the Haute-Garonne département thought. There, they said that if a candle's wax only dripped on one side of the candle during a religious procession, it announced the death of a loved-one during the year. They also said that "bewitched" people could only be cured by a soothsayer using a blessed altar candle on the day of the Chandeleur. He would then draw various symbols on the ground, then mix soild from a graveyard with holy water, only to douse the floor with it together with a mix of poppy, fennel, and wild mustard. But what about the crepes? Yes, the crêpes. Well, back in the day people would place a single Franc coin on top of their ready-baked crêpes. Then, they'd let the coin cool down before rolling it in some paper and placing it in the wardobe until the next year. Why? The tradition was supposed to bring more money into the household. 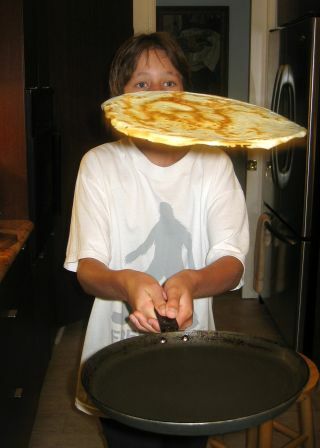 In Brittany, many still celebrate the superstition of the six-crepe flip. Those lucky enough to succesfully turn six crêpes in a row will be married off within the year. Also, young brides who want to remain happily married are advised to throw a crêpe on top of a wardrobe. Another crêpe tradition saw French people holding a gold or silver coin in their hand while flipping a crêpe in their other hand. If the crêpes were turned over on the first attempt, there would be enough money for the family each year. But it wasn't all good luck. In fact, snowflakes brought bad luck, people believed. They said that if snow fell on La Chandeleur then there would be a split in the family or - at worst - a death in the family. Lastly, some of the superstitions were about love - especially for young women on the prowl for a suitable husband. In the Vosges region, young women who wished to dream of their future husbands were tasked with a very specific ritual on the eve of Chandeleur: they had to throw a handful of ashes on burning embers while reciting: "Chandeleur, Chandeleur... show me, while I sleep, the one I will spend my life with." So, there you have it. La Chandeleur - it could just be the most superstitious of them all. Be careful out there!